"Those who fought here in 1862, could they stand here again, would recognize their battlefield today" David Lowe, US National Park Service cartographer and historian and author of "The Battle of Unison"
In early October 1862, following the carnage of Antietam, the major armies of both the Union and Confederacy were within 100 miles of Washington, DC. President Abraham Lincoln was worried but he had a plan. With elections coming up, Lincoln saw an opportunity both to end the war quickly and, perhaps, help with the upcoming mid-term elections. To forcefully push his plan, the President journeyed out to his field commander, General George McClellan, to urge him to rapidly move his forces between General Robert E Lee’s struggling army and the Confederate capital of Richmond. But Lincoln’s audacious plan was not to be. Now the ground on which those events of 1862 took place is a new 8000 acre battlefield historic district. The aftermath of Antietam created an opportunity for a major Union victory. Although Antietam was a Union victory, both sides were weary after suffering a total of 23,000 losses in 24 hours. McClellan had most of his 130,000 Army of the Potomac camped near Harper’s Ferry, strategically wedged between the 75,000 exhausted men of Lee’s Army of Northern Virginia and Washington. However, because McClellan was actually closer to Richmond than Lee, Lincoln saw an opportunity to get between Lee’s army and the Confederate capital and, perhaps, end the war. On October 4th he journeyed out to McClellan’s headquarters in Maryland to push his plan. 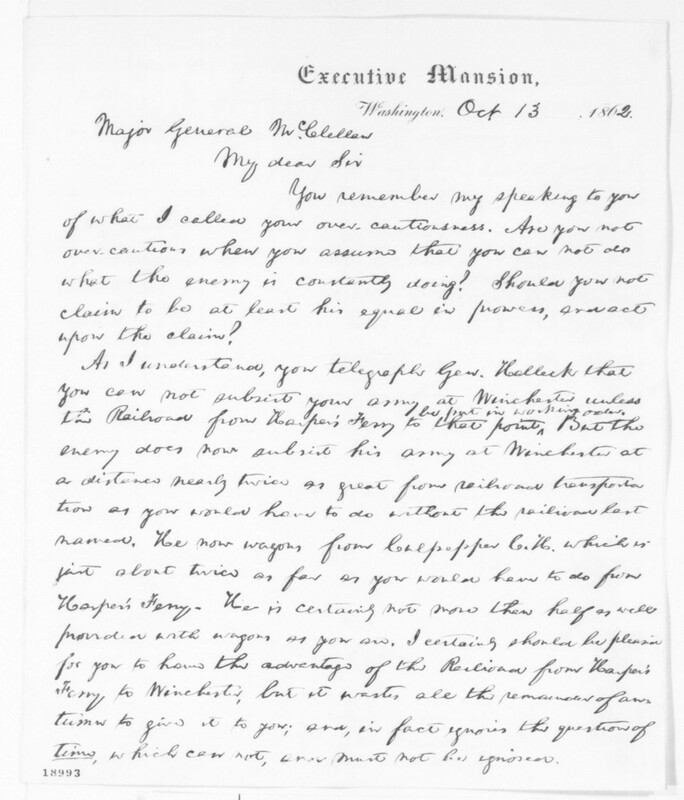 Lincoln followed this meeting with a lengthy letter on Oct 13th detailing his logic and his strategy. 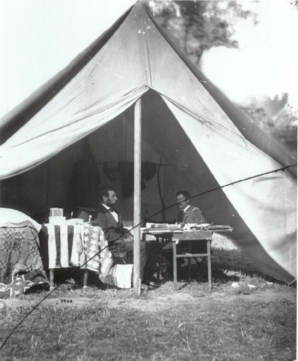 But, it took another week before the details could be worked out and McClellan finally agreed to Lincoln’s blueprint. On October 22 he telegraphed to Washington DC that he “had decided to move upon the line indicated by the Presid’t ”. On October 24, McClellan began to move his huge army across the Potomac River and into Loudoun County on the east side of the Blue Ridge Mountains. Lee saw the danger immediately and began to march his troops south along the west side of the Blue Ridge. He knew of McClellan’s conservative style and developed his own plan to gain the time he needed to block McClellan’s movement toward Richmond. On October 28 Lee sent General JEB Stuart and a modest force of “but 1000“ cavalry and horse artillery with orders to delay McClellan’s very large force. 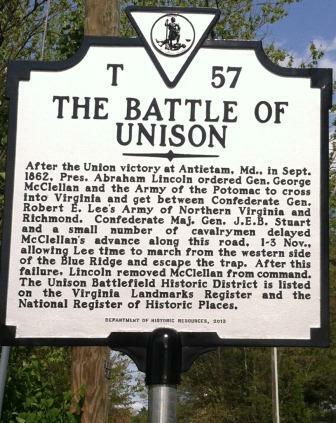 McClellan’s advance units and JEB Stuart’s small force clashed around Unison in early November. 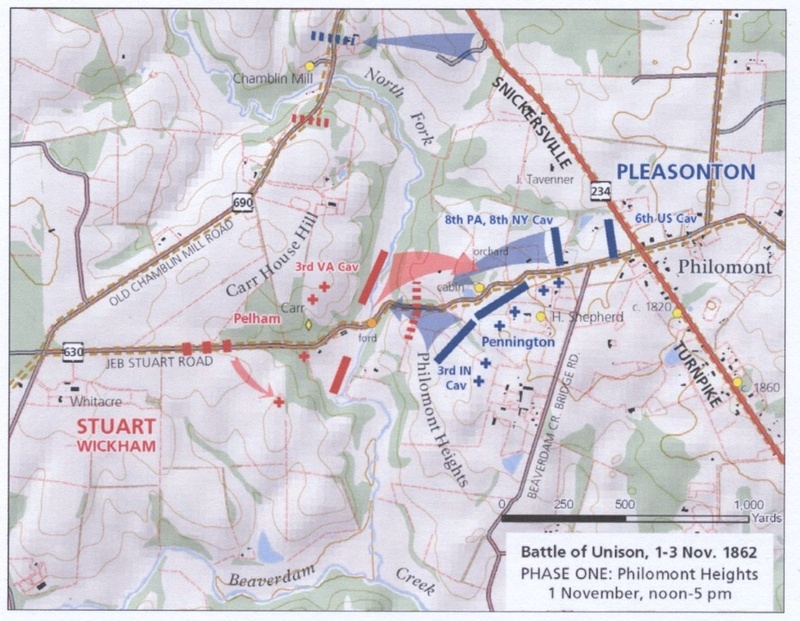 On October 31, Stuart, his dashing artillery officer John Pelham and a small handpicked band, seeking the enemy, rode from Bloomfield through the crossroads village of Unison (often still called Union at the time) and encountered Union pickets and the vanguard of front line Union forces arrayed along the Snickersville Turnpike. Behind them were 90,000 men, wagons and supplies in five corps. The small band of Confederates routed about 100 Union cavalry, chased them to Aldie, then withdrew. 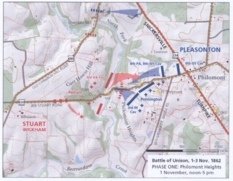 The next day, November 1st , Stuart’s main force, set up a little north of Unison near Philomont, exchanged artillery fire with the Union advance force of a brigade of cavalry and one artillery battery led by General Alfred Pleasonton. 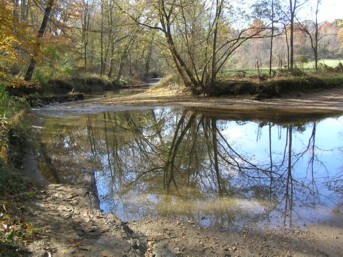 They had a few brief ground encounters across the ford of the North Fork of the Beaverdam Creek, but neither force moved from that small area. Pleasonton, believing he faced a strong force of infantry, wired to McClellan for reinforcements. A contingent of the US 6th Cavalry, a brigade of infantry and another artillery battery arrived late that evening to strengthen the Union advance force. Early on the morning of November 2 the Union force of 2500 cavalry, infantry and artillery began to move south, toward Unison led by a brass band. 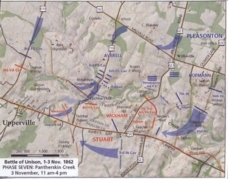 Stuart assembled his small group in Unison, put Pelham’s guns to the front and center, and sent the 9th Virginia northwest toward Bloomfield and the 3rd Virginia south toward Pothouse to secure his flanks. 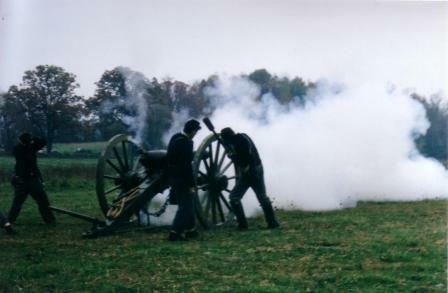 When the Union forces reached the Dog Branch, about a mile north of the village itself, they “shook out” for battle and immediately encountered Confederate riflemen and two cannons deployed just south of the creek. The Confederates withdrew slowly and the assault on the village itself began. Union artillery occupied a hill about a mile north of the village and began a bombardment. Skirmishers deployed along the many stonewalls lining the roads and fields and 700 infantry advanced slowly against Stuart’s cavalry and Pelham’s artillery fire. Stuart withdrew to some high ground a mile south of the village near the old Quaker Meeting House and now it was the Confederate turn to bombard the village and surrounding fields. An observer on the scene reported “the thunder of cannon shook the air and the sharpshooters on either side were hotly engaged”. And, in the village: “furious flames…dense volumes of smoke…terror and confusion…truly frightful”. 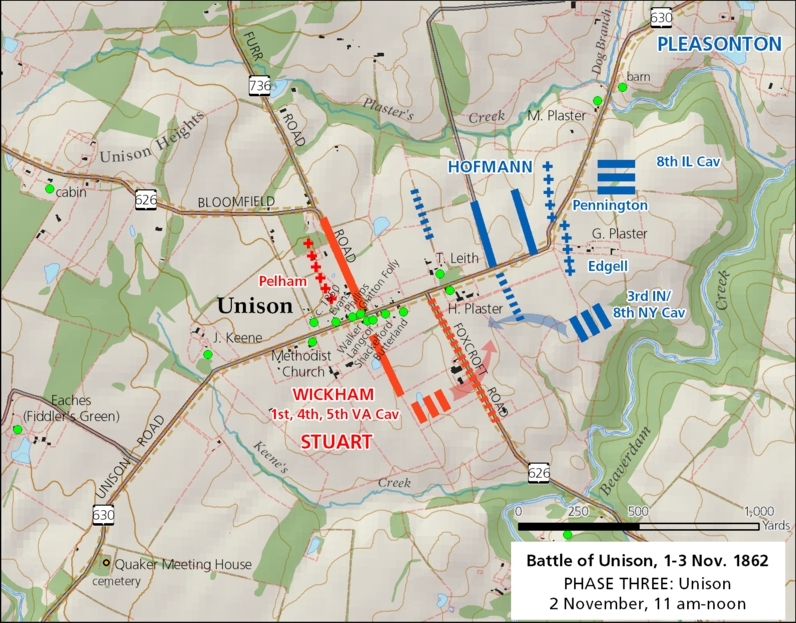 Union forces advanced slowly but steadily along the road and fields meeting Stuart’s forces several times that afternoon and finally reaching Venus Hill (site of today’s “Pelham”) just a few miles south of the village by the end of the day. Union casualties were taken to nearby Bloomfield, or to the Unison Methodist Church. Confederate casualties were treated at the Keene House in Unison. Late in the day the Union main force began to move south following the vanguard. Observers high on the Blue Ridge saw “immense trains of wagons coming from Leesburg toward Unison”. The next day another brigade of cavalry and another artillery battery arrived arrived to strengthen the Union vanguard. Stuart’s band lined up in an advantageous position along the Pantherskin Creek. On Monday morning, November 3rd, as Stuart reported “the enemy advanced on our new position with cavalry, infantry and artillery, moving simultaneously by all the roads and fords”. 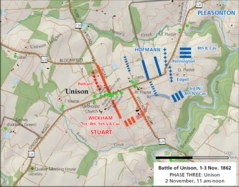 Stuart’s vastly outnumbered band continued to resist and held the advance troops in check a few miles south of Unison for most of the day, then withdrew in a wild retreat through the village of Upperville through Ashbey’s Gap and safety. As they made their withdrawal, the fire of a long range Confederate Whitworth rifle cracked from the Gap and shells landed among the pursuing Union cavalry causing them to hold up. The entire Union Army now advanced in earnest, but Stuart’s small force continued to harass them. 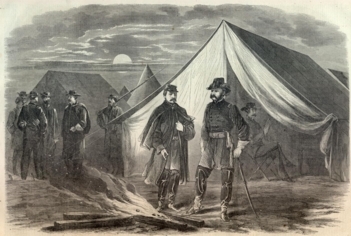 Finally, on November 5, McClellan’s Army of the Potomac was in position to move on toward Richmond. But it was too late, Lee had escaped. 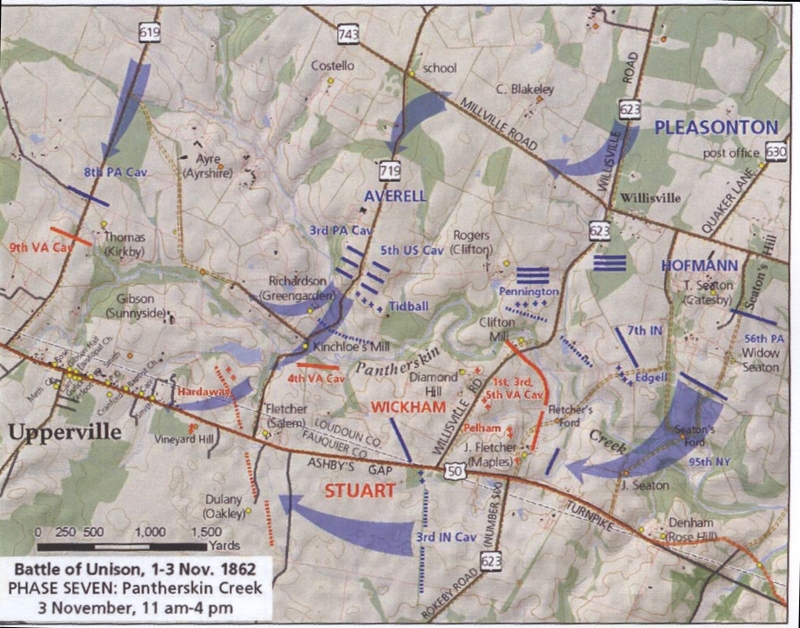 Because of the time gained by Stuart’s delaying tactics at Unison, a major portion of Lee’s force had crossed the Blue Ridge, reached Culpeper and now had time to regroup and prepare for the next major encounter between the two sides at Fredricksburg. Lee’s army and his capital were saved. On November 5, 1862, the New York Times correspondent aptly reported “Stuart . . . baulked what might have been a splendid success”. A greatly disappointed Lincoln quickly followed on November 5th by signing an order relieving McClellan of his command and replacing him with General Ambrose Burnside. 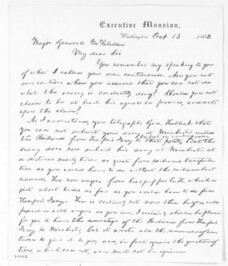 McClellan received the news in Rectortown on November 7th. The terrible bloody war went on for another two and a half years.